Brothers and sisters in Christ grace and peace to you from God our Father and our Lord and Savior Jesus – the light of the world. Amen. In some ways, that’s the way many of us probably feel today. I know I sure have felt that way this past week. We rush through Christmas at light speed only to push it aside just as quickly as it came so we can move on to the next important thing in our life. I was at a local retail store this week. They already have Valentine’s Day stuff out and on sale. Do you know that the season of Christmas for Christians doesn’t actually begin until Christmas Day and isn’t supposed to end until the Feast of Epiphany on January 6th? For followers of Jesus, the days leading up to Christmas Day are not part of the Christmas season – they are part of the season of Advent. Is it possible to lose Christmas that quickly? Either before it even happens or not giving the story of Christmas a chance to linger beyond the morning after? So – it’s New Year’s Eve/Day. A day plastered with images of an old frail worn-out person fading off in the distance as a new fresh faced young person in a diaper comes forth to take over and usher in the New Year. A new beginning. Let’s forget about 2011 and celebrate something new that is about to happen. Welcome 2012 – we are so glad you’ve finally arrived! There’s a similar image in our gospel today in Luke, isn’t there? The prophets Simeon and Anna are old. They have spent years waiting and hoping and praying that the Messiah would come. They are tired. Worn-out. Waiting for death to come. The Holy Spirit has told Simeon that they will not be able to welcome death not until the Messiah comes. Now – they hold in their arms the infant Jesus. The Messiah is here. Simeon believes that in this child God has kept God’s promises. God has acted once and for all. In this infant child, God has addressed our questions of pain and suffering and struggle and death that every part of God’s creation will experience – with the promise of life. There is something that I always find striking about the images in today’s gospel. Birth – new life – and death are closely and intimately connected. Simeon and Anna have been waiting for the Messiah to come in order that death may also come to them. But this word of death is the very light of the world. The story of Christmas, this story of Jesus – draws each of us, you and me, into the story of God who is seeking us and reaching out to us. God seeking to enter into our lives in order to give us life. God’s invitation to you and me in this story is not reflective of the way we may feel the morning or week after the rush of Christmas. Nor is it dependent upon whether or not we keep any of the resolutions we make for ourselves in the New Year. As these two old saints, Simeon and Anna, revealed to everyone in the temple, this child was the one sent by God to bring light to all the world. And this light was not just for Israel, or for the gentiles, or just the Germans or Norwegians, or only those who exerted a little extra effort today and made it to worship even though it’s a long holiday weekend. This story is for all of us – even for those who, for whatever reason – didn’t make it to worship this weekend! As we enter into this New Year with all of the hopes and expectations that it brings, I think it’s appropriate to offer a thought that is part of every Christmas sermon I have ever preached or probably will ever preach. Usually when a baby is born, we like to hold the little one. 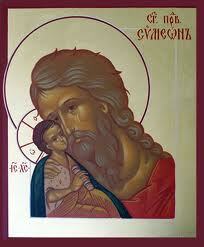 This baby, this child whom Simeon and Anna recognize in the Temple as the Messiah, came to hold us. To embrace us with a love that wakes us up and makes us new each day in order for light to shine in the shadows of this world. This entry was posted on Monday, January 2nd, 2012 at 12:56 am	and posted in Recent Sermons. You can follow any responses to this entry through the RSS 2.0 feed.